Pursuant to Activity 1.2. “Support law enforcement agencies in enhancing investigative capacities” and Sub-activity 1.2.3 “Joint activity with Customs on profiling of containers and enhancement of cooperation in terms of operational issues and exchange of information”, PAMECA V organised a training course on container profiling techniques and the importance of cooperation with police and judicial authorities for Customs employees assigned to Risk Analysis, Antitrafficking and Investigation Directorates. 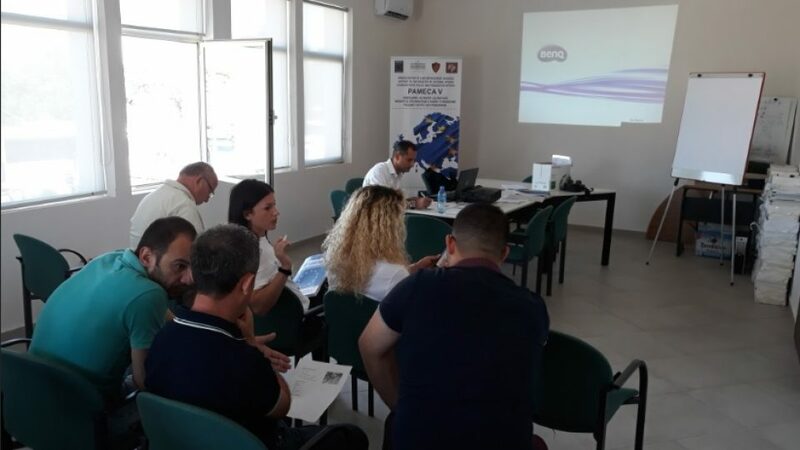 The Training Course was conducted by an Italian expert, who had sound knowledge in the field of Customs investigations and Customs and Police cooperation. Due to his long experience in Albania, the training was tailored in accordance with the knowledge and experience of trainees, illustrating it with EU best practices and Italian experiences in years. Some of the topics treated during the training course related to flow analysis, national and international sources of information, analysis methodology, logistics chain tracking, waste misdeclaration, air couriers risk analysis, the importance of cooperation with police and judicial authorities, etc. This training will be followed by other joint training activities, aiming at supporting Albanian Customs to further develop their capacities in proactively detecting suspicious containers and increase their cooperation with police and other law enforcement agencies.